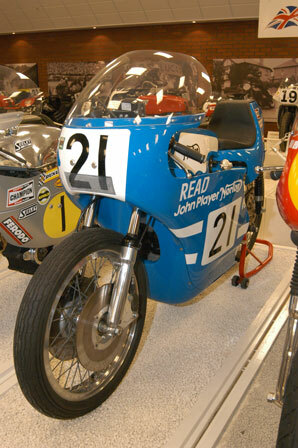 The first motorcycle racing team to be backed by a major brand name was the John Player Norton equipe, which contested Formula 750 events from 1972 to 1974 with sponsorship from Imperial Tobacco, maker of Player's cigarettes. It was also the first Norton factory team seen in action for decades, revitalising the marque and taking on stiff foreign opposition. Based in ex-military buildings at the Thruxton race circuit in Hampshire, the JPN team was set up by Norton Villiers in November 1971 and managed by ex-grand prix racer Frank Perris. After a winter of intensive work it wheeled out sleek, low-slung Formula 750 racers. Their design was overseen by Peter Williams, a top-flight road racerand talented engineer whose father Jack ran AMC's race shop in the fifties. In 1971, Peter had created an effective racer around the Norton Commando roadster's power unit and it formed the basis for the more refined 1972 contender. Williams knew other F750 teams has more engine power, so he concentrated on achieving superior handling and aerodynamics using a mini version of the Commando tubular frame, a pannier fule tank to keep weight low and wind tunnel-designed fairings. The team's number one rider was Phil Read, who took promising fourth places at Daytona in the USA and Imola in Italy. He was also the second highest point scorer for the victorious British team in the Transatlantic Match Races. Later in 1972, outright wins were scored by Williams in the Brands Hatch Huntchinson 100 and Mick Grant at the Scarborough International. All three Player Nortons in the Formula 750 TT retired and the machine's weaknesses, mainly in the transmission, were addresses in a major re-design for 1973.